Home / Television / X Factor Philippines Grand Finalists / X Factor Philippines Grand Finalists Revealed! 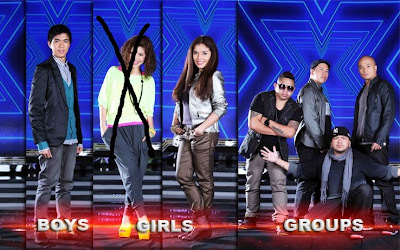 X Factor Philippines Grand Finalists Revealed! Let’s say goodbye to Allen Jane Sta. Maria as the X Factor Philippines 3 grand finalists are revealed! But before that, you may as well read about the X Factor Philippines Live Show Week 8. Last night, Daddy’s Home and Gabriel Maturan were announced as two of the three grand finalists battling out for the coveted 4 million in cash and prizes. Obviously KZ Tandingan and Allen Jane Sta. Maria were left for the bottom 2. For some reasons, I already have a feeling that it’s time for Allen to go the moment that she was pitted against KZ for the judges save performance. Even Charice, their mentor, who was in tears, knew about it as it shows even during her introduction of her girl’s survival performances. She introduced Allen saying that no matter what happens she had already come a long way and she is already a winner. But she introduced KZ in a different way. She mentioned that KZ deserves to be in the top 3. Allen performed “Perfect” by Pink while KZ sang “Ordinary People” by John Legend. During the judges on the spot deliberation, Martin Nievera, Ms. Pilita, and Gary V. saved Charice from the dilemma of having to choose between her own contestants. All three voted unanimously to send home Allen. So that means, KZ will be joining Daddy’s Home and Gabriel as one of the X Factor Philippines Grand Finalists.